I feel your frustration...it is incredibly hard to watch poor refereeing decide a game. Two weeks ago, our girls (U12) participated in a local, competitive tournament in which, after game #1, the young ref told our girls that they were the "most dirtiest" team he's ever refereed. No referee should say that to any team. By the end of the game, it was obvious our girls were beaten down by the referee and his calls. 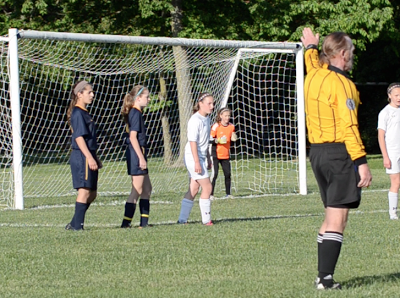 It became clear as the tournament went on that the referee (he called all three games) had a bias against our girls. I have no expectation of World Cup level refereeing but I do expect some professionalism and fairness. Thanks for adding to the conversation. I too do not have high expectation of the local refs, but I do expect them to hustle to get into position and I expect them to be neutral. Sadly that is not always the case. In my post above, both teams in the game were from Cincinnati playing in a Dayton tournament - so there was no local bias. Not sure why he had a bug up his a** against our team. It looks like your daughter plays for CSA. My son plays for Warren County. How can I contact you? I had some of the same issues with the size of my son playing goalkeeper and I'd like to ask you about that. SD, as a referee myself I appreciate you understanding that we don't always get it right. Anyone who does this has no idea of what it is like to get yelled at while at "work". Does your boss scream and hollar about things you do? Maybe in some cases, but not like we put up with. I had a coach tell me that I must have a small ***** after I sent him off very late in the 2nd half after hearing him harp on me all game. I'm a grown man, I can take it, but he went too far. Anyway, as for the fing prick comment, that was out of line in every way possible. You should have reported him to the assignor or to the ref tent. I had an AR call a coach an a** during the game and it made it hell for myself and the center with the parents taking it out on us. Game 1 - I NEVER reverse a call. Ever. I admit there are times where I question a call I've made if it is a bam bam play, but I will never reverse it due to arguements. Game 2 - Doesn't sound offside. If she was offside to begin with and it deflected off the keeper, then she is, if the keeper picked it up and had a brainfart and rolled it to her, game on. Game 3 - There are tournaments where we may have 7 games in one day with little break so he may have been tired, but not to the point of walking to position and not answering your question. Again, it's appreciated that you understand we will never be perfect. We don't get to practice like you do, our games are all we have. Fouls in basketball. Penalties in soccer. Pretty sure this is universal, unless it's different locally in OH.